SMITH is excited to present Unsettled, an exhibition of collage, video and printmaking by artist and photographer Sitaara Stodel. 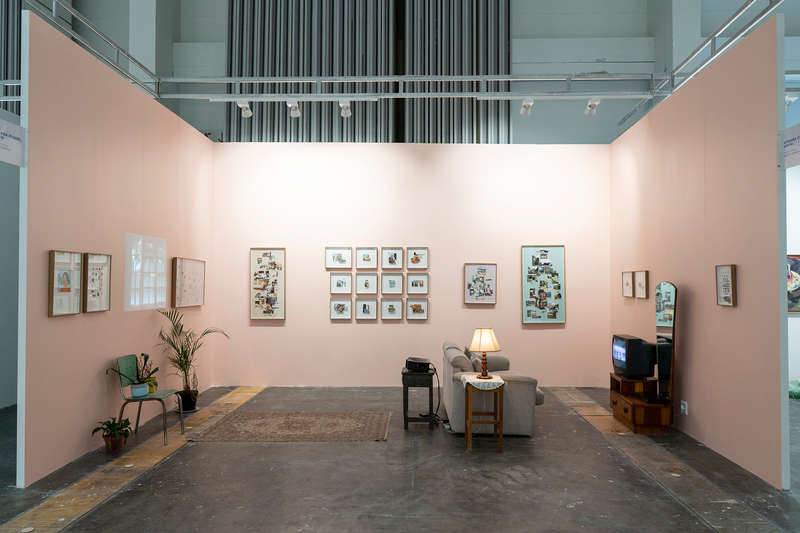 Following a few years of involvement in group shows across Cape Town, most recently The Main Complaint at Zeitz Mocaa, Stodel now further explores her experimental approach to collage-making in a multimedia installation for the 2019 Investec Cape Town Art Fair. In her main body of work, Stodel explores at length the fleeting visual and textural elements that comprise her childhood experience of domestic spaces, punctuated by the experience of moving house - a lot. The artist uses old family albums of strangers to build-up her evocative scenes of home and home-making, playing with a link between collective, ‘crowd-sourced’ home-histories, and intimate home-memories. And in the same way a DJ goes vinyl-digging, Stodel (albeit less pretentiously) thrifts... She finds her source material in second-hand stores by searching through hordes of forgotten Cape Town family photo collections. From here, the work is a process of revival, spinning moments of mundanity - candid portraits in the garden, grandma watching tv, the view from the window - into animated, surreal montages, bringing to life her childhood journeying through homes, suburbs, and landscapes. Similarly to the collage work, Stodel’s video-making technique draws from an engagement with the acutely crafted and staged nature of photography. Shooting one-take ‘performances’, the artist films her hands interacting with collaged scenes stacked on top of one another. Removing, tearing, and cutting away layers by hand, the videos gradually reveal more and more domestic scenes, unpacked and packed up again, in wait of the next fresh start. The real-time shooting and frequent presence of the artist’s hands in-frame re-articulates the tactility of her image-making process, and highlights the role of movement in the exhibition. This direction of this movement is very particular, and we would be remiss to ignore the suburbanness of the Cape Town Stodel evokes, because whether Fish Hoek, Muizenburg, or Tokai, she confronts places of old, white, settled wealth, which historically have the effect of unsettling the presence of working class, poor, or black people. These dynamics - settledness versus unsettledness - reflect the nature of South African land-based histories, but more than that, they describe internal processes that take place alongside movement. How do we situate apartheid spatial and body logics twenty-something years into democracy? And how do these things play out when we are unsettled, perpetually moving, and caught in the betweens of contested spaces? The scatteredness of Stodel’s work is located on the edge of this chaotic relationship, and so, while on the one hand evoking suburban uncertainty and failure, her work simultaneously acknowledges the innate and human nature of the search for home. This search and research of home, is an explicit feature of Stodel’s work, where harsh cuts, sudden tears, and odd disappearances reflect back the inconsistencies (and often pains) of home-making outside the status-quo. Interestingly, it is Stodel’s newest process of production, the transfer printing, that brings all these concerns into an embodied conversation. A transfer self-portrait, made from the disparate textures of swimming pools, bricks and garden plants, unifies the central poetic gesture of the show, which ultimately situates the body as the agent, maker, and holder of the precarious, almost mythical idea we think of, when we think of home. Sitaara Stodel (b.1991) is a Cape Town-based contemporary artist working across mediums of photography, collage, video and printmaking. Following her 2014 graduation from Michaelis School of Fine Art (University of Cape Town), Stodel was awarded the prestigious Tierney Fellowship, granting her the opportunity for further practice and mentorship. In the years that followed, Stodel has taken part in number of shows across Cape Town, including at the Zeitz MOCAA, SMAC Gallery, and Gallery MOMO, and has been ongoingly involved in education. Currently working in the Michaelis photographic department as the technical officer of photography, Stodel is highly accomplished across multiple analogue photographic methods, and this experience has been key in shaping her various approaches to image-making.